Most Americans consume more than 3,400 milligrams of salt per day, which is way more than the recommended limits of 2,300 milligrams for people who are healthy and 1,500 milligrams for those at increased risk of high blood pressure or heart disease. Drinking extra water can help you flush some of this excess sodium out of your body, as can eating foods that are high in potassium. Beans, yogurt and fish are among the better sources of potassium. A cup of adzuki beans provides 35 percent of the daily value for potassium; white beans have 29 percent of the DV per cup; and lima beans or soy beans provide 28 percent of the DV per cup. Other beans average 15 to 20 percent of the DV per cup. Plain nonfat yogurt contains 18 percent of the DV per cup, and the same amount of plain whole yogurt has 11 percent of the DV. Fish average approximately 10 percent of the DV for potassium per 3-ounce serving, although anchovies, yellowfin tuna, ling cod and salmon are a bit higher in potassium, with 12 to 15 percent of the DV per serving. 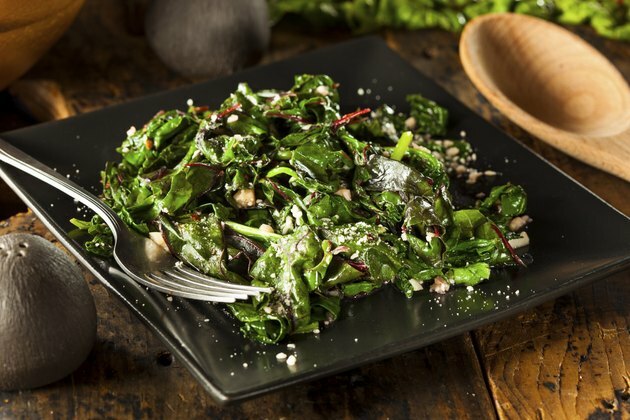 Cooked swiss chard, spinach, hubbard squash and acorn squash each has more than 20 percent of the DV for potassium per cup. An average baked potato with skin will give you about 26 percent of the DV, and sweet potatoes provide 15 percent of the DV each. Although they aren't quite as high in potassium, sliced white mushrooms are another good vegetable choice, with 12 percent of the DV per cup. A medium artichoke contains about 12 percent of the DV. Dried fruits are concentrated sources of potassium, with each 1/2-cup serving of raisins, prunes, dried apricots or dried peaches providing 18 to 22 percent of the DV for potassium. Bananas are another good fruit option, with an average banana providing 12 percent of the DV. A 1/2-cup serving of pureed avocado provides 16 percent of the DV. A glass of orange juice is also a potassium-rich choice, with about 14 percent of the DV. The best way to reduce sodium in your body is to reduce your sodium consumption. Limiting processed foods, including soups, cold cuts, pizza, snack foods and cheese, will help with this, as will eating out at restaurants less often and not adding salt to your food when you cook at home. Instead of reaching for the salt shaker, season your food with citrus juices, herbs and spices. Are Certain Meats Good to Eat When Having High Blood Pressure?